My kids love Pillsbury toaster strudels. I love that I can make myself one for breakfast too. I mean seriously, this was genius, it’s like a strawberry pie for breakfast! Using Puff Pastry, and about 5 minutes prep plus 15 minutes baking, you can make these at home! Pie for breakfast, seriously. I used strawberry pie filling, but think of the possibilities here people. Apple pie filling? Apple PIE FOR BREAKFAST! Thank you pillsbury for changing our mindset on what’s acceptable. Kidding. 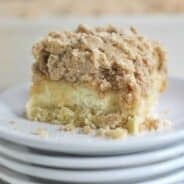 You’re here cause you are going to make this for dessert! That’s the beauty of these struedels. 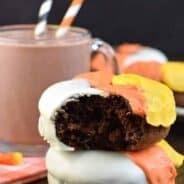 Breakfast or dessert, they are delicious and easy! Thaw puff pastry according to package directions. Unfold and cut each sheet of pastry along seams (making 3 strips on each). Cut each strip in half, for a total of 6 rectangles on each sheet (12 in all). Poke many times with a fork and lay on parchment lined baking sheet. Bake in a 400 degree oven for 10-12 minutes. Spoon strawberry filling into center of pastry, careful to not go over edges. Return to oven for 3-4 minutes. Meanwhile, beat cream cheese with powdered sugar and milk for about 3 minutes until creamy. Add more milk to get to desired consistency. Remove pastries from oven and drizzle with cream cheese frosting. Serve warm! **you can also add some of the cream cheese filling to the pastry. Spoon a dollop on the pastry, add the strawberry pie filling, return to oven for 3-4 minutes. Then drizzle with more frosting. This is MY favorite! You may need to double the filling/frosting if you do it this way though! I LOVE Toaster Streudels! They’re so yummy, and I only had them when I spent the night at one friend’s house as a kid since my mom didn’t buy them for us. But I have fond memories of them and these look even better! 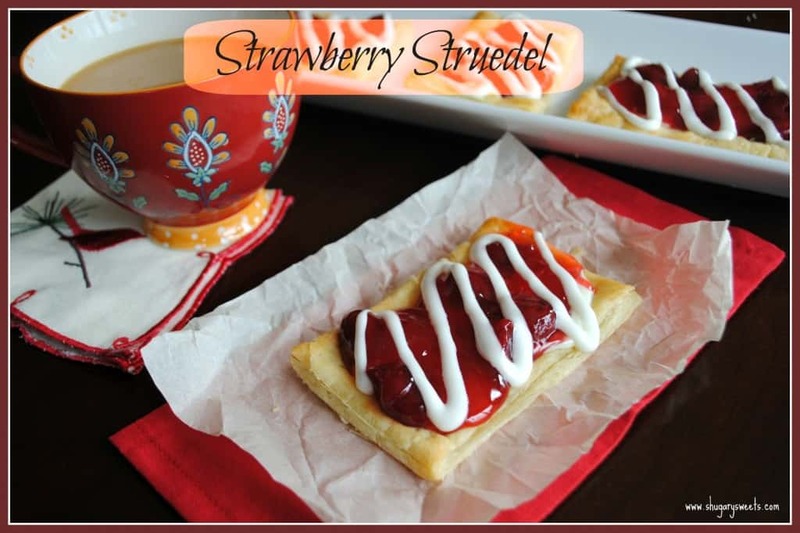 My kids love toaster struedels…I love that now I can make them from home!!! 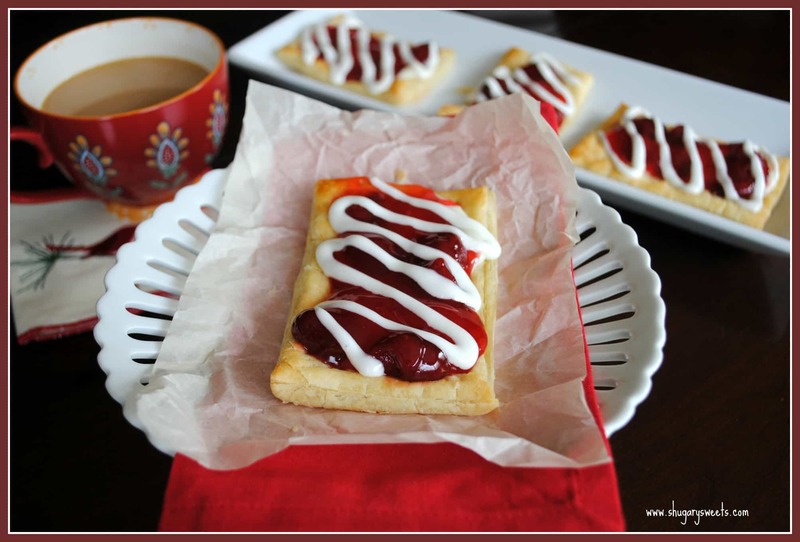 I love puff pastry & just hosted a giveaway for a cookbook using it. THis looks AMAZING. I WANT! This is such a good idea. I’ve eaten more toaster streudels than I can count in my day! This looks amazing. Great idea!!!! Yum! What a great recipe! The pictures look beautiful! Oh my goodness, these could be so dangerous! Tempting, tempting! 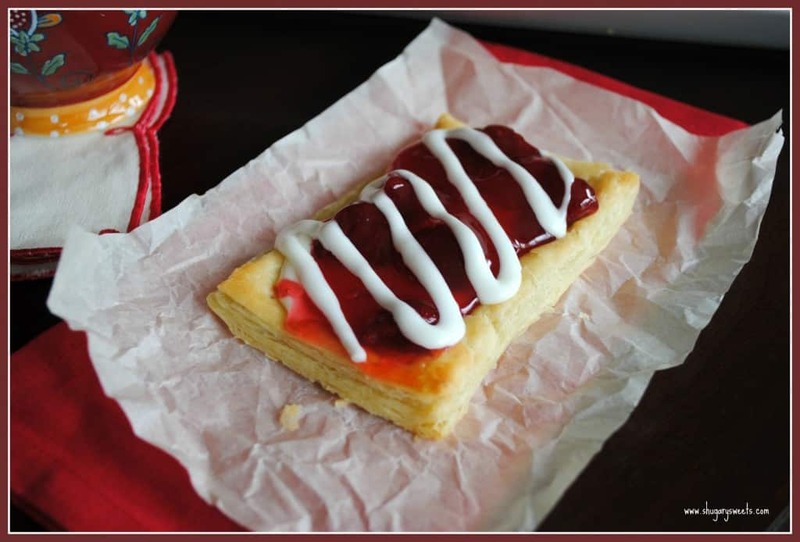 Your photos are amazing – it makes you feel like you can actually reach and grab one of the strudels! 🙂 YUM! Wow, this looks better than a toaster strudel! You can put as much filling and frosting as you want. 😉 Never even thought of making my own, great idea! Seriously, I want to live at your house with all the fabulously looking sweets you make!! This is awesome! We love those Toaster Struedels too. Bu they are so darn expensive. This is perfect! Thanks! Amy! Yum. Your must have happy kids. I love these! 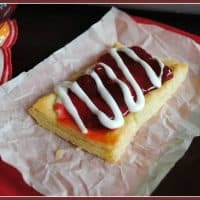 My son loves poptarts but I want to figure out something I can make at home that he might like just as well and these may just be it!! Found you on Sweet as Sugar Cookies party. Oh this looks wonderful. Thanks for sharing at this week’s BFF Open House. Yum! This looks like my ideal breakfast. 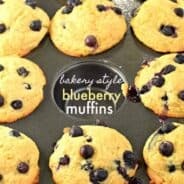 Great creative recipe! You’re right – the possibilities are endless! Thanks for the inspiration. YUM! Those look delicious! You’re right that there are lots of ways to mix it up too! Yum Yum!!! I just found your blog on foodie friday. I’ll host a party every month with a different theme and would love you to join! Please visit my blog for more information on “My Sweet Party” post uploaded 2nd of May. Oh yummy! I love struedel! I have to put this on my list of breakfasts to make! Um…how would you put the filling INSIDE the pastry? Just curious. Thanks! You can cut two pieces place the filling inside and pinch the edges. Might work?! Hi, there. This looks awesome, but Pinterest won’t let me pin it with “broken” images. Could you please fix that? Thank you so very much. Just so you now – having made these for awhile now and LOVE them – if you cut your dough into squares, add the filling to the middle and fold over to triangle shape, bake then ice…..you have an Arby’s turnover fascimile. And who doesn’t love those things! !